Our students have had the chance to work with Nejla Yatkin/NY2Dance and her company extensively over the past two weeks. All of the young dancers have taken her master class, attended the Show & Tell and seen the performance of Oasis twice this weekend. This has given the dancers the opportunity to learn Nejla’s specific style of choreography and teaching, along with an inside understanding of her work. I have to admit I was worried that the tough subject matter in Oasis would be a barrier for our young dancers. Themes of human struggle, torture, democracy and freedom surrounding the middle east are explored extensively in the work. But the curiosity and enthusiasm in which the dancers have approached the work shows great maturity and understanding. 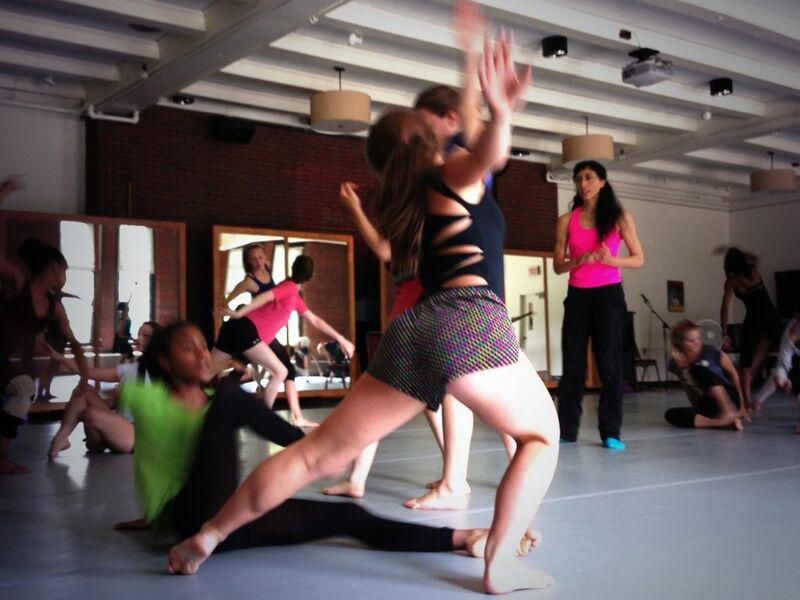 Nejla looks on as dancers improvise with partners in her Modern Repertory class. 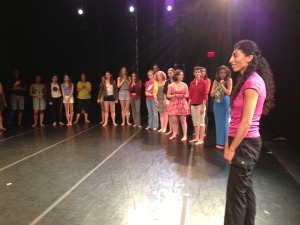 Students will perform an excerpt of her work during their final performance. On Friday night, I had the opportunity to attend a hall meeting after the performance. These hall meetings are held each night in the dorm and give the students an opportunity to talk about their experiences from the day along with go over any information about the days ahead. The counselors urged the students to talk about specific moments in the work that stood out to them or surprised them. Our students noticed detailed moments about the lighting, costuming, symbolism and performance quality. As a group we were enamored with the beauty of the performers, the emotional depth they brought to the stage and the rich integration of so many elements into one performance. We debated over subjective ideas of tone and questioned different choices of design. Starting to open up the students to critical discourse about performance and choreography. Getting our students to think about these elements along with discussing their opinions openly is just another tool we hope they can take home with them. As our students continue to work with Nejla this week in her Modern Repertory class I am certain they continue to dance, feel, ask and ruminate on the work in a new way. Nejla leads the young dancers in an improvisation during her Show & Tell at the Theater.